Faith and Crafts Volume 2 "Robes chiseled by a Buddhist sculptor: Gakyu Miyamoto"
The form is human, but it is not human. The creation of Buddhist sculptures is strictly governed by ritual rules called "giki." Every detail, down to the facial expression, shape of the fingers, and stance, is an expression of Buddhist thought. Buddhist sculptors, called busshi, hone their craft to express the teachings of Buddha with accuracy and solemn majesty. One exception, the celestial robes worn by Buddhist statues, is barely mentioned in the ritual rules. For Buddhist sculptors who must work within predefined rules, it is one of the few areas where they can inject their own creativity. There is no one correct way to depict the texture of the robes as they flow toward the feet or the overlapping folds of the cloth. The sculptor works with a chisel in the left hand and a hammer in the right to carve the wood through trial and error—just like real clothing, but without losing the sense of stateliness. Working between solemn majesty and reality, the sculptor creates based on the image of the Buddha in their mind. Buddhist sculptor. Born in Kyoto in 1981. 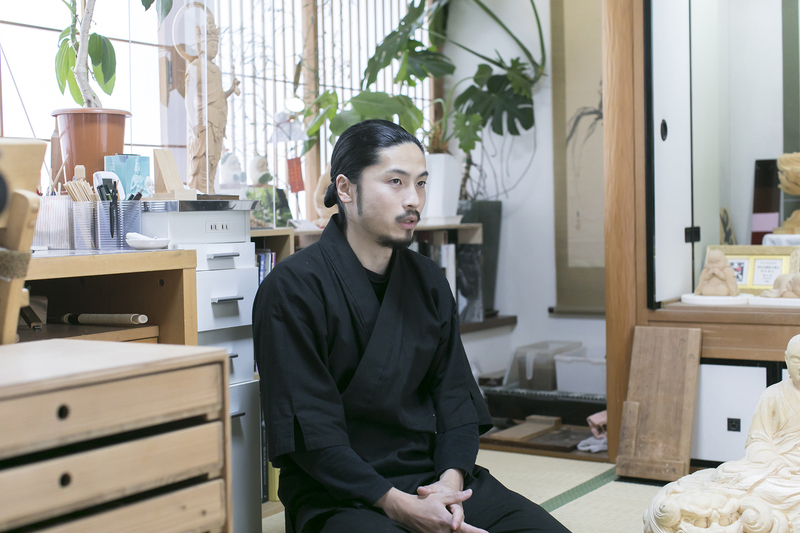 After graduating from high school, he studied fashion design at an art junior college and vocational school, worked as an illustrator, and began to train as a Buddhist sculptor in Kyoto. In 2015, he completed nine years of training and opened his own studio, Miyamoto-kogei, to sculpt and repair Buddhist statues. 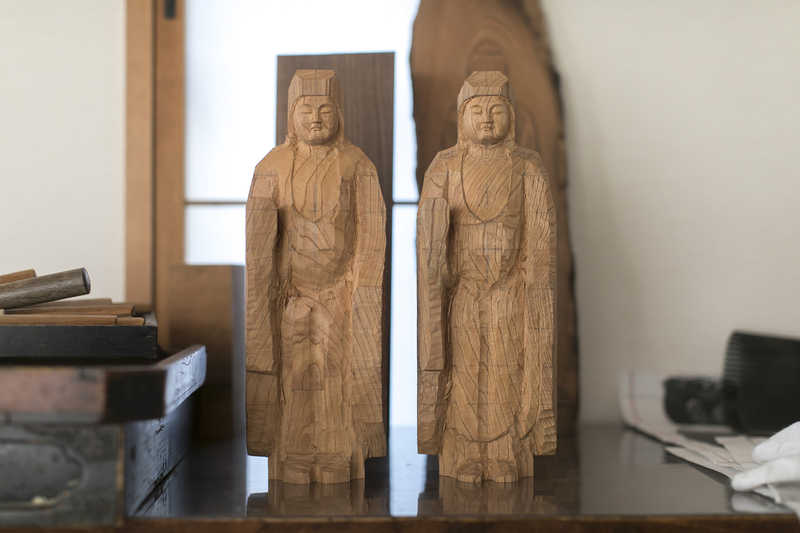 The Buddhist sculptor Gakyu Miyamoto showed us a Buddhist statue from his studio. It was zelkova wood used in a house that was over 100 years old, so perhaps the tree was over 200 years old. The surface was almost entirely carbonized in the flames, but Miyamoto says careful chiseling began to expose fresh and youthful wood little by little. Miyamoto finished a training period of approximately nine years and left his master to become independent in 2015. 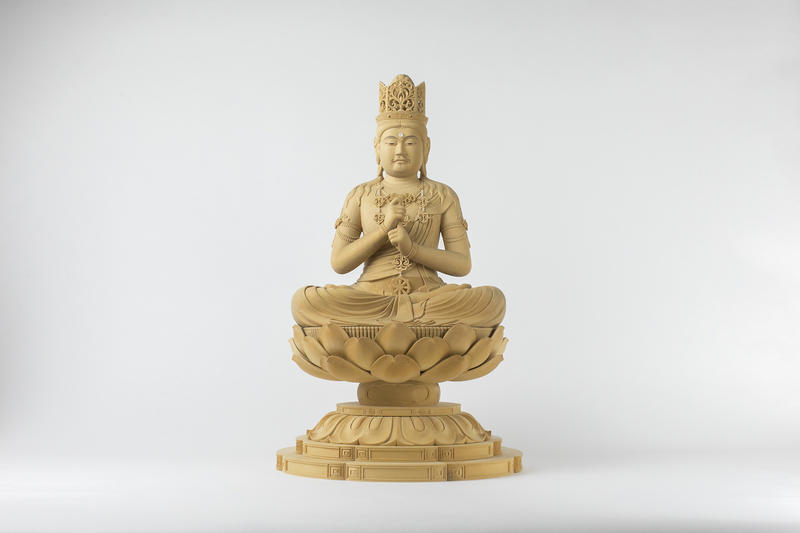 This was his first commission to produce a Buddhist statue since becoming a Buddhist sculptor. A Buddhist statue resting in Miyamoto’s hand. 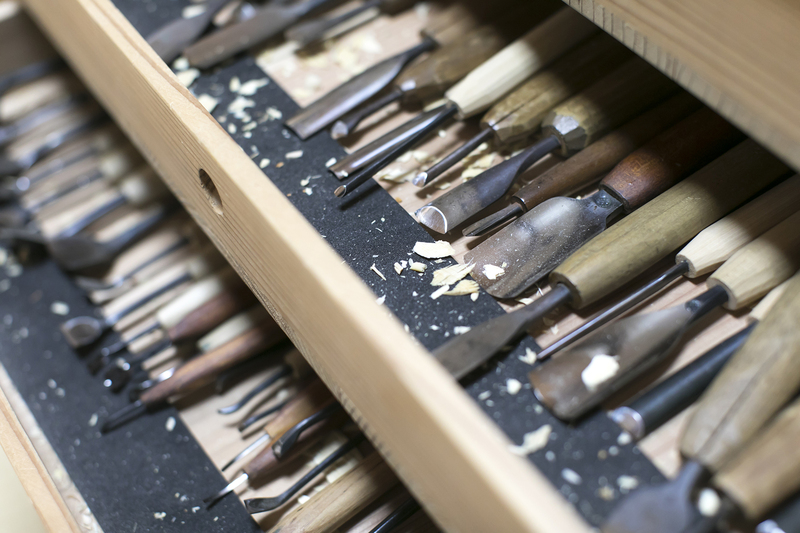 Each movement of the chisel carefully brings its form to life. Miyamoto was born as Takayuki Miyamoto and raised in Fushimi ward in the southern part of Kyoto. 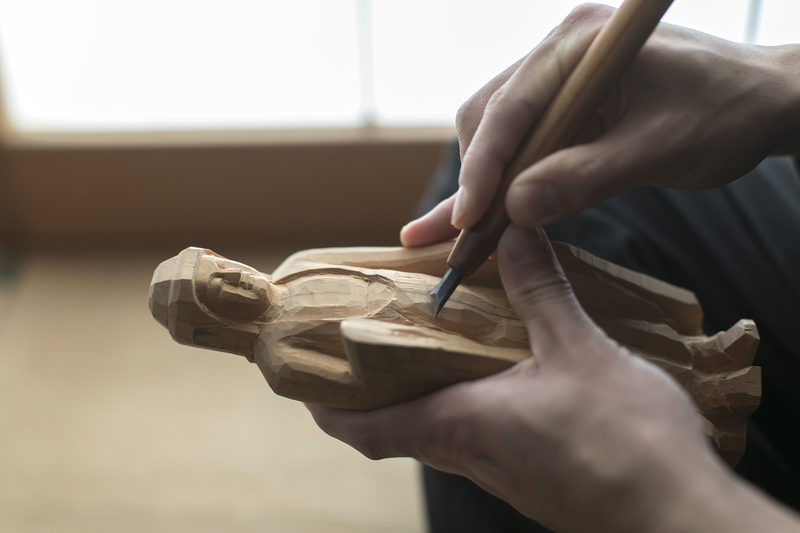 What path did he take to become Gakyu Miyamoto the Buddhist sculptor? He was always interested in fashion. In a collection of graduation essays from junior high school, the young Miyamoto wrote that he wanted to become a fashion designer. After graduating from a hometown high school, he joined the fashion design program at an art junior college. Through his study of art and fashion expression, he was captivated by design in the pursuit of the beauty of form. Upon graduation he entered a vocational design school in Tokyo as a scholarship student and was drawn even deeper into the world of fashion design. From his start in fashion design, Miyamoto branched out into abstract paintings as he began to work vigorously to show his work at exhibits. But living in Tokyo with the pressures of part-time jobs and creating art began to take a toll on 24-year-old Miyamoto. It was his first time visiting a Buddhist sculptor’s studio. Brought in by his brother to help his brother’s Buddhist sculptor friend who needed an extra pair of hands, Miyamoto saw an unfinished Eleven-Faced Kannon statue standing seven shaku (approximately 2.1 meters) high. His older brother had introduced him to the master to help with painting work, one of the final hurdles remaining before its completion. Miyamoto had not been interested in Buddhist sculptures before, but he was happy to have part-time work using a painting brush. For the next six months or so, Miyamoto led a double life working in graphic design during the day and wielding a brush in front of Buddhist statues at night. Chisels and planes. The number of tools increases as the pursuit of the ideal shape continues. Much time and effort are spent on care and maintenance as well. The fashion and painting he had once been so interested in could no longer satisfy Miyamoto once he had been exposed to Buddhist sculpture. After thinking about it for a while, his master consented. Becoming a new apprentice at 25 years old was a late start for a craftsman. The studio’s interior seems too clean and organized to be a sculptor’s workplace. For a Buddhist sculptor, training is demanding and long. They must learn painting, lacquering, metal leafing, and other work required to create Buddhist statues in addition to sculpting. On top of that, the repair and restoration that makes up much of a Buddhist sculptor’s work requires skills not found in creating new statues. The majority of craftsmen enter this world in their teens due to the expectation of a long training period. 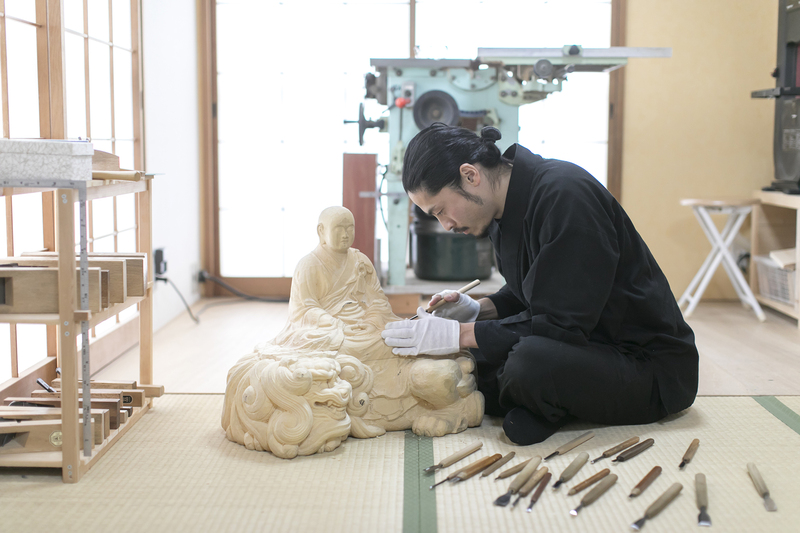 The age of 25, when Miyamoto began his apprenticeship, is the age when other craftsmen begin to end their training and strike out on their own as independent Buddhist sculptors. Miyamoto didn’t know how to hold a carving knife, much less how to sculpt anything. Day after day, he grew frustrated with his inability to do anything and just watched his master work. Miyamoto was his master’s first apprentice. His master became a Buddhist sculptor through old-fashioned training in which nothing is taught, and the apprentice must watch the master and steal his techniques. But his master told Miyamoto, “I’ll show you all the work and answer any questions. So hurry up and improve your skills.” True to his word, he explained all of the work in detail. Because he was his master’s first apprentice, Miyamoto was fortunate enough to experience the entire range of work a Buddhist sculptor takes on. He was also able to review by taking the techniques he learned from his master and teaching them to apprentices who joined after he did. And in April of 2015, Miyamoto completed nine years of training and left his master to work on his own. Buddhist statue parts awaiting restoration. After the washing step, they are drying in a disassembled state. Each piece is an example from the past. When he became independent, Miyamoto selected “Gakyu” as the name he will use as a Buddhist sculptor. The characters for “self” and “rest” combine to mean “without self” and are a warning against excessive self-assertiveness for Miyamoto, who sometimes found himself arguing with his master. He chose a quiet residential neighborhood near Matsunoo-taisha Shrine for his combined studio and residence. The well-organized nature of the studio is striking when first entering Miyamoto-kogei. There are no tools out on the work surfaces and not a single wood shaving is on the floor. Since becoming independent, Miyamoto has begun thinking about Buddhist statue depictions of his own. This led to the beauty of form from the fashion he once studied to overlap with Buddhist statues in his mind, he says. Buddhist statues are governed by rules known as “giki.” Every detail, down to the facial expression, shape of the fingers, and stance, is an embodiment of Buddhist thought. The rules exist to protect and pass on the basic forms of the past. One exception, the clothing worn by Buddhist statues, is barely mentioned in the ritual rules. As a result, there is room for Buddhist sculptors to inject their own creativity—just like actual clothing, but without undermining the sense of stateliness. 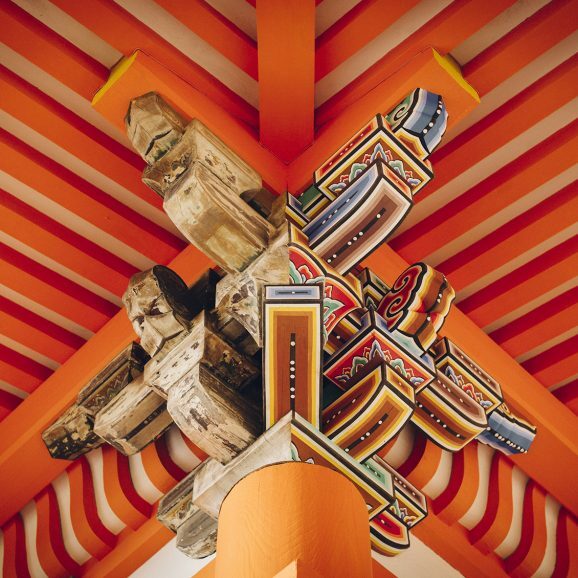 Working between solemn majesty and reality, Miyamoto works to create based on the image of the Buddha in his mind. Miroku Bosatsu seated, the principal statue of Daigo-ji Sanbo-in Temple, by Kaikei. When asked about his ideal Buddhist statue, Miyamoto’s answer is almost instantaneous. “Since I was an apprentice, I admired this statue more than anything. On my days off, I would often take binoculars with me to visit Daigo-ji Temple. 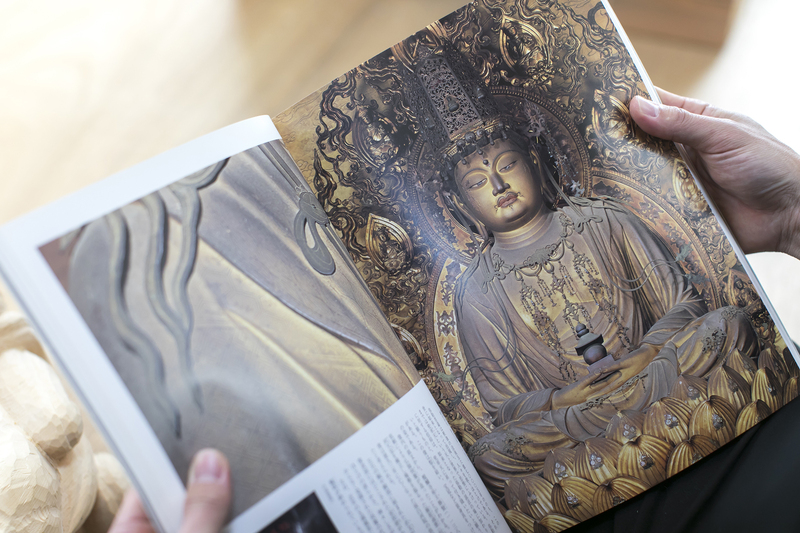 The uniformity, lively energy, and clothing of Kaikei (a Buddhist sculptor of the Kamakura period) make it the ideal Buddhist statue in every way for me.” As he speaks, Miyamoto opens a well-worn and tattered pictorial book. That event was a special museum exhibit near the end of his apprenticeship. Learning that the Miroku Bosatsu statue he had long admired would be shown, Miyamoto visited the exhibit filled with excitement and anticipation. But there, he saw a slight distortion in the form he had thought was perfect. For the next year, Miyamoto was unable to sculpt Buddhist statues. 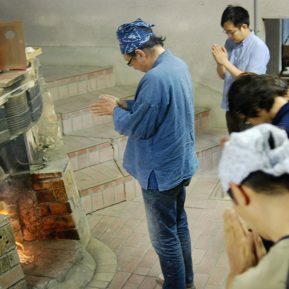 After becoming independent and with his feelings finally beginning to resolve, he received the commission to sculpt the Buddhist statue from the wood burned in the fire. As Miyamoto works, a photo of Daigo-ji Temple’s Miroku Bosatsu seated statue is always placed by his side. In April 2017, a Shaka Nyorai (Buddha) standing statue one shaku (approximately 33 cm) high carved from the wood burned in the fire was completed. After a production period of about one year from the order, the day of the statue’s consecration ceremony arrived. Miyamoto named the statue “Koen,” or flames of light, in the hope that the zelkova wood that withstood flames to become a Buddha would protect the family for many years to come.